It is necessary that before you start a relationship with your financial advisor, you must be absolutely clear about the following 6 things. 1. What is your underlying philosophy with respect to risk and returns? Obviously, you have done your background checks about the financial advisor and are convinced about the professional ability. But you still need to be convinced about the investment approach. Remember, financial planning is a long term and a long-drawn process. There are no short cuts to creating wealth over the long term towards meeting your financial goals. 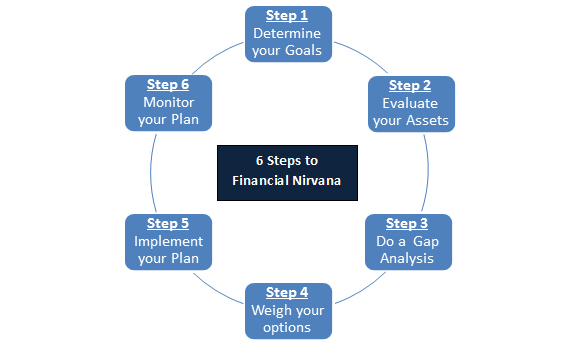 The financial advisor’s philosophy will have to strike a delicate balance. It needs to be aggressive enough to growth wealth, pragmatic enough to protect your wealth and flexible to change with the changing times. These are qualitative issues but you can surely grasp these facts over 3-4 coffee meetings with your financial advisor. 2. Can I understand your investment process? This may appear to be a slightly generic and an intrusive question but do not be afraid to pose this question. How does your advisor classify investments into risk and return buckets? How does the advisor make a choice of which originators to opt for? How does the advisor ensure that your investment portfolio constantly manages the risk-return mix as you move along? How smartly does your advisor manage your taxes and liquidity? At the end of the day, your advisor has to be disciplined, meticulous and organized in approaching your finances. Process matters a lot, in fact even more than the product and the domain skills. 3. Can I understand your client profile? The purpose is not to embarrass your financial advisor by asking them for classified information. Of course, a lot of client-specific information is classified and the financial advisor will not and should not divulge it to others. But, you need to understand if your advisor is actually adding clients or losing clients over a period of time. That is a barometer of your financial advisor’s acceptability in the market. Also be cautious if the client is spreading the services too thin across too many clients. It is good to have a large client base but if that leads to commoditizing the service, then you stand to lose in the bargain. 4. Can we put down the bouquet of services that I will get from you? This may sound like a redundant question but it makes a lot sense to get clarity on these issues. For example, will the advisor only provide advice or also provide investment support? Will the advisor provide ancillary services like tax planning, tax filing and drafting of will? Is this part of the annual fees charged or will they be billed separately? Will the financial advisor provide tech support in the form of SMS updates event updates by email, a secured login to monitor your portfolio etc? All these items need to be discussed threadbare and also documented at the beginning itself. This will avoid confusions at a later stage. 5. How will the financial advisor keep me updated on a regular basis? This is a very critical question as the relationship is a continuous relationship that is likely to last over a longer period of time. Your financial advisor needs to give you a variety of updates on a regularly basis. Check if the advisor will give you market updates, news updates and investment and product updates on a regular basis. Will the advisor provide your entire financial plan in a documented version? How frequently will the financial plan be reviewed and changes suggested? Will the advisor take the initiative to do an intermediate review in the light of special macro and micro events? How will the samples of all these updates look like? Right at the beginning, document samples of such updates and MIS reports for future reference. 6. How will you manage your revenue streams? Ok, this may sound a little rude but that is not the intent. Different financial advisors have different pricing models. The most basic model is that of a fixed annual fee payable at the beginning of the year plus documented list of reimbursements against invoices. This is the most preferable model for financial advice. There are also advisors who will charge you a lower fixed rate per year but will ask you to pay a success fee if a certain threshold returns is crossed. The problem with this approach is that it impels your advisor to take unnecessary risks to achieve higher returns. Lastly, there are advisors who will charge you a very nominal fee but they get paid by the product originators like mutual funds and insurance companies. Such agents are best avoided as their primary commitment is to the product originator and not to your financial plan. Start by asking some really pressing questions to your financial advisor. It only helps your planning process along the way!